Like many Swansea City fanatics, given our recent, rewarding and justified good press and “big up” in the National Media I’ve been much given on reflecting from whence we came – but – truly, as Harold McMillan once said – “We’ve never had it so good “. Just as curiously, when asked why things could go wrong for him, the then PM and his party, he presciently replied … “Events, dear Boy, events”. (He was an Old Etonian after all, a sort of truly upper class Cameroon). Let me tell you a secret – midway through our first season in the Premier League – last season since we forget – we WestStanders were having a pre match Pint in the Concourse when one of my compadres said that if we lost today…..,,,,,, ” it’ll be your bloody fault since you’ve had a haircut and a shave “. I must confess I had, indeed, turning from Razputin/Worzel Gummage into a 60yr old Borstal Boy. Needless to say, we proceeded to lose ( the 3-1 Norwich City game) since you ask. At that point, unsurprisingly, I vowed it would NEVER, EVER happen again. So this season started with me as a recently shorn, clean shaven skinhead, and progressed through the months with my developing hirsuteness, all the while stipulating that there’d be no change prior to our making those 40 “magic” points. I’m here today to tell you that after last week’s convincing win v Newcastle, the Fu Man Chu is trimmed, again, and the fading Barnet is neater than before. Here’s a question for you, and please, be honest when you answer in your own head. How many of us, myself included, would have said pre season we’d win the Capital One Cup and be safe on 40pts some 10 games from season’s end. Wished, certainly. Hoped, fervently. Believed, perhaps, but not a large number, I’ll presume. The above , of course, doesn’t pre-suppose that we expected our side to struggle or do hugely worse – but I feel we were all a little nervous again given we’d gone through yet another Managerial change. As it happens, we’d be hard pushed to argue that on the contrary , it couldn’t have gone a great deal better than it has, and we’re indeed witnessing our proud Club’s best ever year, in this, our centenary season. Results, and their effects (events, dear boy) are paramount, of course, but all of us who’ve been there to see, for instance, the first half against West Brom at Home, Michu’s 2 goals at the Emirates at the death, or the bizarre 0-0 at Sunderland when we played them off the park will always remember individual occassions over a Seasonal outlook, within limits. Bloody hell, we didn’t half play well and look good, and that’s a major source of pride in itself. Moving on what this means without any caveat is that we’re a seriously achieving Club with a seriously resultant outcome from this best of Seasons and, if we continue to perform at the level we’re capable of, there’s no reason to think that it’ll be any different from now on in. We’ve learned from Michael Laudrup, our justly esteemed Gaffer, that it’s possible to follow stellar performaces with yet another, and also it’s feasible to bounce back from disappointing ones to go better again. This charming, serious, grounded Manager has taken the PL by storm, part of his charm being his culpability in admitting his limitations (shock,horror) and his few wrong turnings being equally accepted with his many and more various successes. It would seem that his fantastic, World Class playing career has given him nothing other than a sensitive and friend winning personal charm. Just watch him being interviewed in ANY situation and tell me you don’t feel proud that he’s in charge of our Club. Respect, Guv’nor. So, as ML has pointed out, you motivate players by setting them new and different targets, and he’s concentrated our players’ minds by pointing out that this weekend’s visit to West Brom is our chance to establish supremancy (or not) from the 2 teams percieved to being the “surprises of the season” in their performances. It’ll be hard, we know, but part of the ongoing motivation will surely include what my compadre and ST fellow Jim voiced in a conversation with me today. His theory was this – having already achieved stability, and won some serious silverware to boot, there will be many eyes cast our way. For the players what a chance to prove a) they can be good enough to be here next year b ) for some, what a chance to showcase their talents and move on to bigger (if not better) things and c) if you weren’t in either of those 2 categories, here’s a chance to get in. Laudrup, he insists, is likely to have made them aware of all of these possibilities and MORE, so we shouldn’t think that we’re going to complacent. It seems to me to be a vaguely compelling argument, so we can genuinely hope for more decent things out of this smorgasbord of a season. Last year to the Hawthorns was a stunning, snowy trip , where Gylfi Sigurdsson’s double saw us come away with a 3-1 win in a superb and classy passing Away performance, so a repeat of that would be highly acceptable. Still, as some things change, some remain the same. Albion are still a hugely competitive opponent, and whilst their squad hasn’t changed radically, there’s an argument to be made it has improved. Here it is, currently,………………. Rather than go through the squad one by one, some players I’d suggest have been hugely influential in this fine team’s progression, and you’ll excuse me if I start at the top. The Manager, Steve Clarke, although previously a no 2 at Chelsea, Newcastle and Liverpool has always been considered a first class Coach, so although it may have seemed like a risk when he replaced England Recruit Roy Hodgson , he immediately asserted his presence on the Training Field, and even that odd beast “the modern football player”, can’t fail to have been impressed. Albion’s players weren’t , and their early season results were exceptional. They’ve since hit one or two blips, but ask their fans what they think and there’ll be a large proportion happy with where they are. 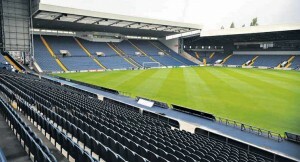 Talking of England’s Mr Hodgson, as the previously employed WBA Manager, he was perhaps well positioned to persuade Ben Foster, Albion’s keeper to come out of his self-imposed England exile, and the suggestion is that the Baggies keeper, who’s having an outstanding year, is likely to be called up Nationally soon. In MF the key performer is Claudio Yacob, a much underrated Argentine defensive MF’er who’s ball winning and control is as important to them as our own Leon Britton. Up front, the Man/Boy Romelu Lokaku, on a season long loan from Chelsea, continues to show the form that should make Fernando Torres doubters at the Bridge take a chill pill – here comes the new Didier Drogba. Chelsea’s loss this year is Albion’s gain. Looking through the list, the other outstanding performers are the sublimely skilled Chris Brunt, a sort of Jordi Gomez with attitude and application ; Zoltan Gera, the flaky (Hungarian) MF’r- veers from the divine to the ridiculous and Peter Odemwingie, the QPR player manque, famed for his transfer deadline day faux pas, but dangerous on the field. I also admire James Morrison, the Scot another product of Middlesbrough’s underrated Academy. Shane Long, ex Reading, can sometimes be a buzz saw nuiscance to defenders, and has great heart. I’ve hinted above what I think ML’s mental approach might be (albeit simplistically) to the Players, so I’m perfectly content to go with whichever team he sees fit, though, if Chico is still unfit (and we KNOW what GM can give us ) it might be interesting to see how Kyle Bartley copes at the back. Given that our next two games, at Home as well, are against Arsenal and Tottenham Hotspur and the delight that this evolving team and season continues to give us I can only wish you as much hapiness as I’m getting. We are living a rather more structured dream than some in the recent past. Enjoy.